The 1986 Boston Red Sox season involved the Red Sox finishing 1st in the American League East with a record of 95 wins and 66 losses. 1986 was the first time since 1904 that the Yankees finished second in the standings to the Red Sox. 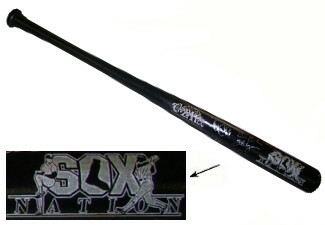 This Boston Red Sox Cooperstown Engraved Black Bat is signed by 19 players including: Oil Can Boyd, Mike Brown, Wes Gardner, Bruce Hurst, Tim Lollar, Joe Sambito, Calvin Schiraldi, Bob Stanley, Rich Gedman, Marc Sullivan, Marty Barrett, Pat Dodson, Spike Owen, Ed Romero, Dave Stapleton, Mike Greenwell, Bill Buckner, Steve Lyons, and Mike Stenhouse. MAB Hologram and Certificate of Authenticity from Athlon Sports.